Step 1. Look at different religious icons, and study the different patterns created in stained glass windows. Step 2. Use a blacklead pencil to draw nativity figures on each of the three shapes. Mary and Joseph on the large totems, and a manger on the oval shape. Alternatively, you may choose to draw two shepherds and a sheep, or turn the totems horizontally to create the animals in the stable. Totems can also be cut to change their shape. Step 3. Using an assortment of handmade collage shapes, collage the backgrounds of the figures – explore contrasting colours and patterns. Trim off any paper overhanging the edge. 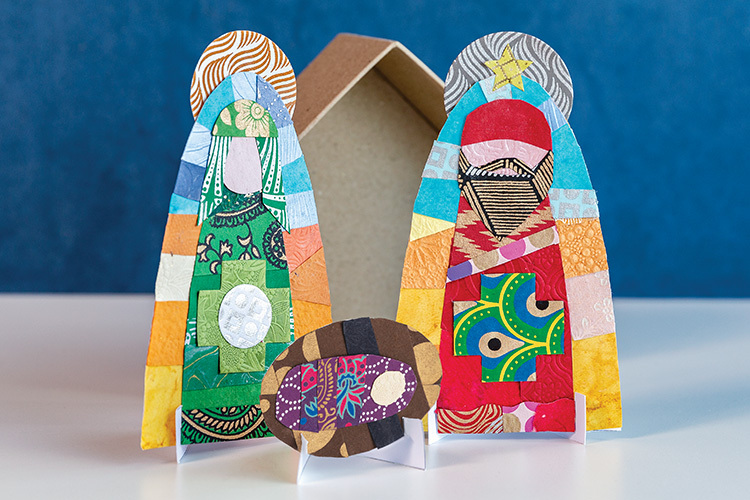 Continue to collage the foreground figures of Mary, Joseph and baby Jesus. Step 4. Using the stands provided, assemble and position as required to display upright. NB: Figures can be used as part of a whole class nativity diorama.